SCENARIO: we’ve all just watched Virginia handle Tennessee, beating them 65-51 to win their very first national championship! (I’m always a bit surprised to see that the Cavs have never won it all, only coming as close as two Final Fours in the 80s.) Virginia prevailed in a matchup of 1 seeds in the semifinal, beating Gonzaga, while 2-seed Tennessee defeated the real surprise team of this tournament, the 10th-seeded Iowa Hawkeyes. 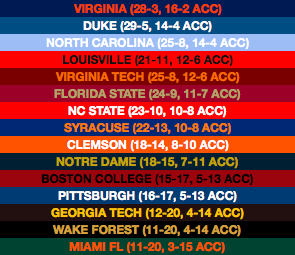 Virginia finishes the regular season having lost only to Duke (twice), but a complete dud in their first ACC tournament game (a 43-38 loss to Syracuse) leads many to wonder if UVA can actually have any tournament success. Duke suffers a three-game losing streak to end February, including their second loss to Syracuse, but rebounds to finish 2nd, two games behind the Cavs and tied with the rival Tar Heels. 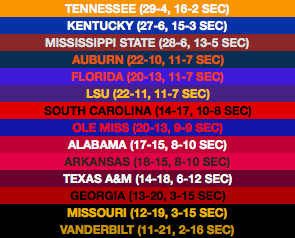 Tennessee reaches 15-0 in SEC play before finally dropping two of their final three SEC games to Kentucky and Auburn. They’re the only team left on Mississippi State’s schedule that manages to beat them, as the Bulldogs’ 4-4 record ends up at 13-5. That includes the SEC tournament, where they beat both Kentucky and Tennessee convincingly. Pretty much a best-case scenario for them, and they wind up a 2-seed in the NCAAs (as do Tennessee and Kentucky). A pretty amazing late-season surge! So when I mentioned earlier that Iowa made the Final Four, you probably didn’t expect this, did you? The Hawkeyes went 2-7 in their final nine games, and finished 12th in the Big Ten after losing the tiebreaker to Rutgers and an almost-as-disappointing Ohio State. But, I also mentioned they were a 10 seed – if the tournament started today, BracketBot would have them as a 7 seed! 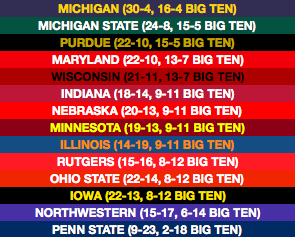 That might seem like a short dropoff for seven losses, including a sweep at the hands of Rutgers, but Iowa made a long run in the Big Ten tournament, beating Northwestern, Wisconsin and Maryland before falling to top-seeded Michigan in the semifinal. At 22-13, they’re still good enough to get in, and they sure make it count. 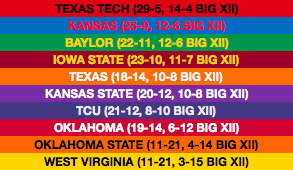 As we speak, on February 6, the Big XII is out of sorts. It’s an excellent conference (in fact, I still rate it #1 ahead of the Big Ten, despite what some other metrics are saying), but it’s a bit topsy-turvy. Kansas State is in the lead, with Baylor a half-game behind, and Texas Tech & Kansas, the presumptive favorites, are languishing in a tie for fourth. But in this sim, order is restored. TTU wins out to win the conference, and Kansas nearly does, losing once to TTU but also at Oklahoma late on. Kansas State, on the other hand, has a tough end to their season, dropping six of the final nine to finish just 10-8. Still more than enough to make the tournament – any of the top eight teams in the Big XII will make it as long as they don’t utterly collapse. Even Oklahoma, 6-12 in this sim, is still a tournament team. Despite finishing 14-4 in conference play, and tied for the top spot, I think this would be a tough outcome for Villanova and their fans. 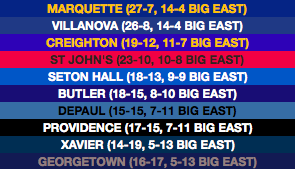 A heartbreaking 3-game skid near the end of the season (@ Xavier, vs. Marquette, vs. Butler) sees them lose all three by a combined four points. That allows Marquette to swoop in and be the #1 seed in the conference tournament, although Nova is still viewed as the better team. It’s a terrible end to the season for Georgetown, as they lost 8 of their remaining 9 games, only beating Butler. Well, hello Washington! 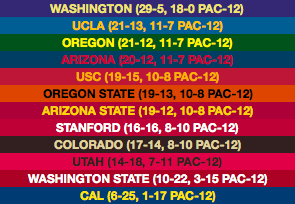 The Huskies successfully run the table in the Pac-12, showing that this version of them definitely is for real. They win 6 of the remaining 9 by double digits, and despite not winning the Pac-12 tournament, UW is the Pac-12’s only real hope at tournament success. The other surprise of this outcome is Oregon – the Ducks pick up seven wins in their last nine, and after beating Oregon State in the Pac-12 tournament, they’re chosen as one of the last four teams into the field. Off the top of my head, I wouldn’t have thought it was possible for Oregon to earn an at-large bid at this point in the season, but this is one path forward. Heartbreak for Arizona State (like I’m used to): they lose their last four games (including to Utah in the Pac-12 first round), and are the last team cut from the NCAA tournament field. There’s only one instance of bid thievery in the sim, so they know exactly who they can blame (besides themselves), but more on that later. Yeah, that’s right, we’re not done! 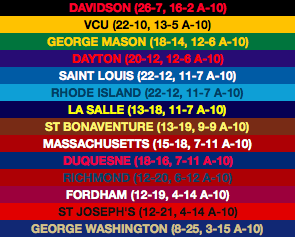 I gave the WCC a writeup in the last Season Sim, and the A-10 gets one this time, with one of the only scenarios that sees them get three teams into the tournament. VCU, at the moment, appears to be near the cut line for NCAA tournament inclusion, and on BracketBot they would be one of the last four in if they weren’t projected as the autobid winners. So, if VCU can tread water and repeat their previous performance, I think they should get in. 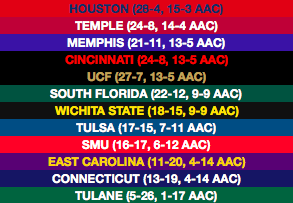 VCU does lose three more games in conference play, but all by single digits and none to a bad team, so they’re in, albeit as one of the First Four. Davidson has a little bit of a tougher road, since they’re not totally on the at-large radar, but winning nine of their last 10 conference games and reaching the tournament final will do that. The only team to beat them, in both instances, is Rhode Island, who win four straight to make the NCAA tournament. They’re a bit lucky in avoiding VCU, who lose early, but they pick up the autobid. The picture for the rest of the tournament field is rarely this clean, but this time it is: Gonzaga, Nevada, Buffalo and Hofstra all won out through the regular season, and all avoided upsets in winning their conference tournaments. The SoCon has two highly regarded teams, Wofford and UNC-Greensboro, but both fall short when Furman wins the autobid. The NIT is won by Florida, defeating Lipscomb in the final by a score of 66-65. A great season for Lipscomb, who went undefeated in the Atlantic Sun Conference but was upset by North Florida in the tourney. Often when a low-seeded team advances really far in the tournament, they’ve gotten a little bit of a leg up from the chaos gods above. For example, last year Kansas State made the Elite Eight, and they did well to beat Kentucky to get there, but that would have been much less likely if they’d had to play Virginia in the second round instead of UMBC. Iowa gets several bumps here – the highest-seeded team they have to play in their four rounds through the South Region is their first-round matchup with (7)Cincinnati. Still, it’s about who can win the most games, and the Hawkeyes do that. The first three wins are all convincing, actually, until a five-point squeaker with Wisconsin. Other accolades go to Louisville for reaching the Elite Eight despite their 7 seed (they’re probably better than that, but their résumé in the sim warranted it), and for Murray State making the Sweet Sixteen. Alright, that’s all for this Season Sim! I hope you enjoyed, and enjoyed the slightly different format. Let me know if there are any features you’d like to see in the next Season Sim – that will come your way on Sunday. Stay tuned for another BracketBot update on Friday, and I hope you tune back in for the rest of this season! See you soon!